Connecting reading and writing to the work students do in their other courses and to reading and writing in the workplace, Subject & Strategy goes beyond other rhetorical readers in the accessible writing instruction if offers at such an affordable price. 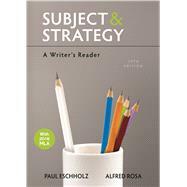 This text provides the strategies your students need to approach any writing subject. With engaging readings, innovative classroom exercises, and effective writing assignments, Subject & Strategy guides students in selecting, practicing, and mastering writing strategies that will help them succeed in any discipline or career track they choose. Students are encouraged to see themselves as writers, and thorough coverage of reading and writing, research, documentation, and grammar provides a foundation for success.